Aloe true belongs to the family Asphodelaceae ( Asphodelaceae ), which is closely related to miraculous families of amaryllis and asparagus. 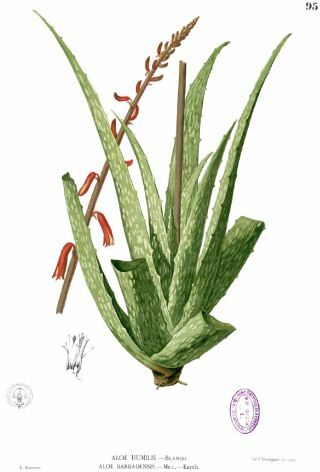 Aloe Vera itself is a plant that probably has the second highest number of scientific publications about its effect after ginsling - more than 3,000 publications are currently available on this plant. A recent review of the state of scientific knowledge about the healing effects of aloe is Akaberi2016tea . 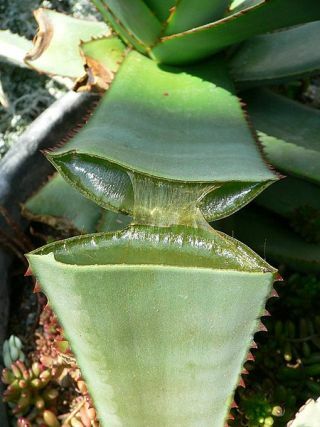 Aloe leaves are fleshy, succulent. By simple extrusion of the pulp from them can be prepared gel, which is used in food and beverages. The gel contains polysaccharides composed of units of mannose, glucose and other monosaccharides, mainly acemanan polysaccharide, which improves wound healing and has wider beneficial effects. In addition to vitamins, minerals and other common substances, the putative position in the phytochemical profile of aloe takes anthraquinones, for example rein. A recent review of the health effects of the reine is Sun2016csr . The positive effects of aloe on healing wounds and burns (one of the traditional indications of aloe) summarizes Hashemi2015rpa . Relative aloe tree ( Aloe arborescens ) has been shown to have antiviral effect against influenza and other respiratory diseases ( Glatthaarsaalmuller2015aaa ).